In the town of Ebreichsdorf, south of Vienna, Austria, children from Syria and Afghanistan have found a place they now call home. “These children are here because they fled their own countries for various reasons,” says Andrea Schritter from SOS Children’s Villages Austria. Ms Schritter manages a house for accompanied refugee minors which opened in October 2015 and is now home to 15 children aged between nine and 18. “They came here, so they can live in peace and safety, enjoy an education and develop in a way that wasn’t possible in their home countries,” she says. 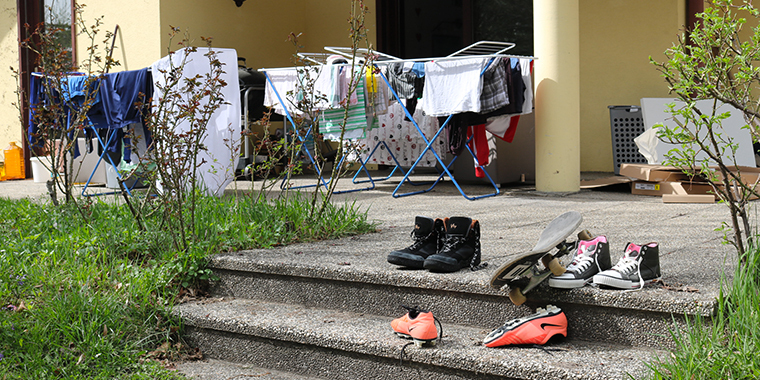 The Ebreichsdorf house is one of 14 homes operated by SOS Children’s Villages Austria for young refugees who arrived in the country without their parents or caregivers. “Our aim is that the children can grow up in a family-like environment, where they feel at ease, at home and can relax. This home should also be a place where they are able to be sad, angry or homesick and miss their parents,” says Andrea Schritter. She adds that a further aim is that daily life is “as normal as possible” for the children, who after finishing their homework do sports, ride their bikes or meet with friends and neighbors in the local community. Ms Schritter is part of a multicultural team of six colleagues who take care of the children and often bring their own children and partners to the house. 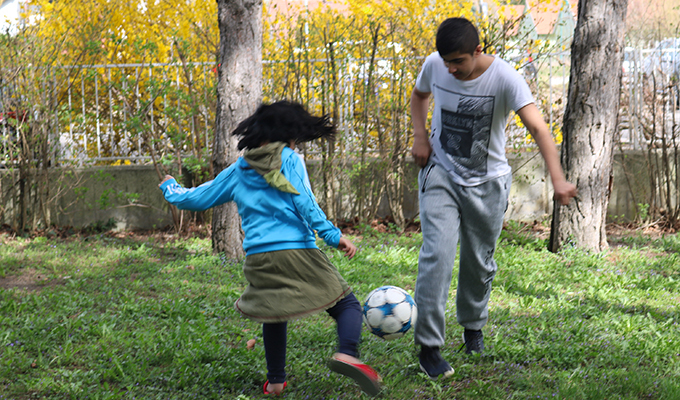 Two children from Afghanistan play football in the backyard of their home in Austria. Photographer: Tania Thorngreen. Like in every family there are highs and lows. Andrea explains for her a high point is that the children are proud to live in the house and are all very well accepted by the school, the neighbors and the local community. She is also pleased with the strong bond that has developed between the children who have “really grown up together, like brothers and sisters”, even though they are from different countries and families. “They really respect each other and help each other out,” says Andrea. But she adds that like in all families the children also argue and fight, take sides, move out of bedrooms, and sleep on mattresses in other rooms. “Everything is good here, we have everything we need,” says one 16-year-old boy from Syria whose parents are currently in Turkey. A nine-year-old girl from Afghanistan says she likes living in the house, but it would be better “without the caregivers”, so she could “eat crisps all the time and watch TV”. One of her brothers lives with her, but she explains that her parents and four other siblings are still in Afghanistan. “I like my room because I feel safe there. I don’t like playing with dolls, but I like to play football and school is fun,” she adds. Most of the children are in contact with their parents and bad news from home has an effect on the whole household. “The father of two brothers who live here died, it was terrible. All the children were affected and concerned about how their mother would cope alone,” says Ms Schritter. However, Ms Schritter and her team make sure that happy times compensate for the sad ones in this busy home: “We have a lot of celebrations here, for birthdays, when someone leaves or arrives or when the children get school reports. With so many children, there is always something to do,” she says.